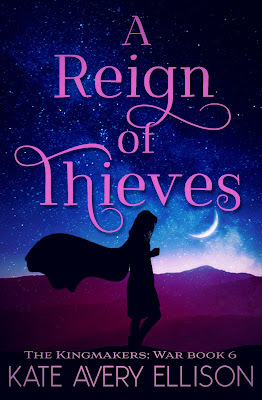 A REIGN OF THIEVES is here!! A Reign of Thieves is available to purchase or to read in Kindle Unlimited now. This one is about twenty percent longer than the others, and just as full of angst, romance, and sassy dracules. Brace yourselves for book 7 in the beloved Kingmakers' War series! In the north, Briand struggles to hold her ground as thief-queen against slavers and other threats in the wretched city of Gillspin. Meanwhile, her reputation grows as more and more misfits and orphans flock to join her alter ego, the Scarlet Blade. Kael of Estria, Monarchist spy and now the captain of Prince Jehn's royal guard, must rescue the Monarchist refugees from Cahan's army. Prince Jehn is locked in a battle of wits with the queen of Nyr, his wife in name only, whom he is secretly in love with. The queen, sometimes an ally and sometimes an enemy with her own agenda, has secrets that Jehn cannot decipher. As they battle for dominance in the Nyrian court, the consequences might prove deadly. Loyalties will be tested. Love will be questioned. Secrets will be revealed. Hearts will be broken.